U.S. markets strong Friday performance pushed major indexes into positive territory for the week. Continued rebound from early-month declines cited as a main driver. S&P 500 Index +1.6%, Dow +1.4%, Nasdaq +1.9%, Russell 2000 +1.3%. Energy, utilities led sectors. Materials, consumer discretionary, dragged lower by homebuilders, underperformed. Positive breadth on NYSE (4.4:1), Nasdaq (2.8:1). Treasury yields strengthened modestly; 10-yr. note yield -2 basis points (-0.02%) to 2.88%. Commodities: WTI crude oil advance persists, driven by recent stockpile drawdown, lower U.S. rig count (+1.29% to $63.55/bbl. ); COMEX gold lower (-0.2% to $1328/oz. ), industrial metals higher. Economic data: Light day for economic releases, weekly domestic oil rig count declined (1293 vs. 1284). Chinese House Price Index showed residential property prices decelerating year over year (5.0% vs. 5.3%). U.S. equities opened higher, continuing Friday’s momentum, tracking gains overseas. European stocks moving up midday. STOXX Europe 600 +0.5%, DAX +0.5%, FTSE 100 +0.3%. Asian markets closed higher. Nikkei +1.2%, despite stronger yen, after the Bank of Japan (BOJ) stated it would maintain its current policy course; Shanghai Composite +1.2%, Hang Seng +0.7%. China President Xi may extend his rule beyond 2023 as the Communist Party proposed repealing term limits. Treasury yields falling ahead of Federal Reserve (Fed) Chair Powell’s first Congressional testimony tomorrow. 10-yr. yield -4 basis points (0.04%) at 2.84%. Commodities: Oil -0.5% to $63.20/bbl., gold +0.4% to ~$1335/oz., copper +1%, U.S. Dollar Index is -0.3%. Economic releases: Chicago Fed National Activity Index below expectations (0.12 vs. 0.24); New Home Sales, Dallas Fed manufacturing due out later this morning. S&P Global raised Russia’s credit rating to investment grade, sending the ruble sharply higher. NAFTA talks resume in Mexico City as U.S. trade policy remains in focus. We are raising our 2018 S&P 500 Index earnings forecast and year-end fair value target. Perhaps the most impressive element of fourth quarter earnings season has been the strong guidance corporate America has provided. In response, we have raised our S&P 500 operating earnings growth forecast for 2018 and our year-end S&P 500 forecast proportionately. Our revised year-end S&P 500 fair value range of 2950-3000, approximately 7-9% above Friday’s index close, represents a 19.5 price-to-earnings ratio on $152.50 in earnings per share. See our latest blog and Weekly Market Commentary, both due out later today, for details. Stocks: As noted in Outlook 2018: Return of the Business Cycle, LPL Research’s S&P 500 Earnings gains forecast are supported by LPL Research’s expectations of better economic growth, with potential added benefit from lower corporate tax rates. Though guidance stole the show, highlights from strong results for the fourth quarter include the strongest increases in earnings (15.3%) and revenue (8.2%) in over six years, a 35th straight quarter in which S&P 500 earnings beat consensus estimates, and the strongest revenue beat rate (77%) in decades. Earnings season winds down this week with about 30 S&P 500 companies slated to report. Week ahead. U.S. fourth quarter gross domestic product (GDP) and inflation data highlight this week’s economic calendar. A relatively light Monday and Tuesday will give way to highly impactful fourth quarter data on Wednesday. For the United States, GDP, Personal Consumption, and Core PCE will be released; the Eurozone will see the Consumer Price Index released that same day, providing key central banks with more inflation data to scrutinize. 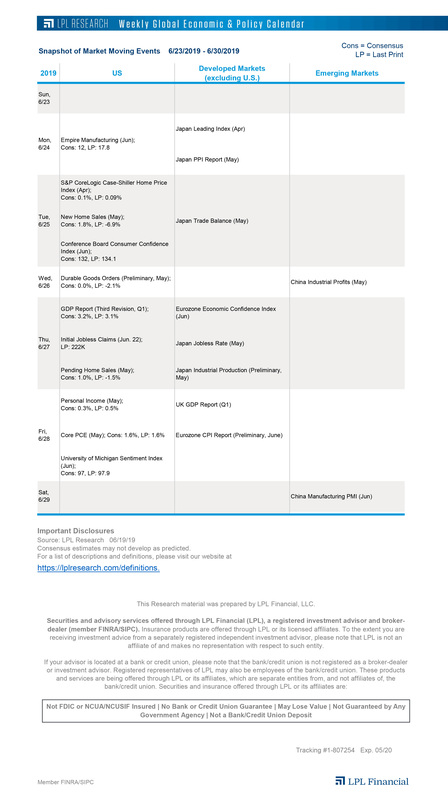 Manufacturing Purchasing Managers’ Indexes (PMI) for Japan and China will be released as well. Thursday brings the Markit Manufacturing PMIs in the Eurozone, including Italy, France, Germany, and the United Kingdom. University of Michigan Consumer Sentiment for February and fourth quarter Canadian GDP cap off the week. March is nearly here. The month of March brings with it longer days, basketball brackets, and Central Bank interest rate decisions. That’s right, the European Central Bank, Bank of England, BOJ, and Fed are all set to announce interest rate policy next month. This week in the Weekly Economic Commentary we preview the big events coming up in March that matter to your investments. TGIF. The S&P 500 gained 1.6% on Friday for the second best daily return this year, and is now only 4.4% away from new highs. That is a far cry from the 10% correction it saw earlier this month, and Friday’s bounce also marked the second consecutive higher weekly close. To put the recent action in perspective, five times over the past two weeks the S&P 500 has closed up more than 1%–this happened only four times in all of 2017.